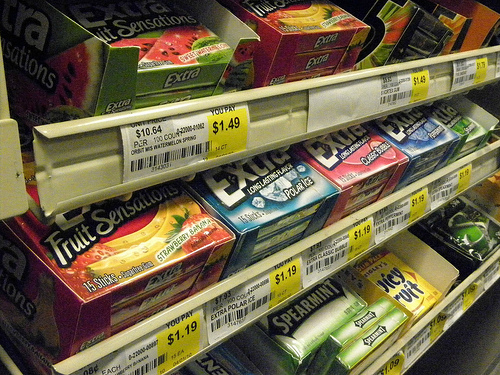 Food Costs > How Much Does a Pack of Gum Cost? How Much Does a Pack of Gum Cost? Chewing gum, available in various shapes, flavors, and colors, has been used for thousands of years now, becoming a part of our daily lives. Gum is believed to freshen bad breath or even work as an effective mental booster. Although it does have benefits, some people choose to chew gum simply because they like the flavor or find the chewing motion to be soothing. On average, a simple package of gum that contains 12 to 60 pieces at the local grocery store will often cost $1 to $2 per individual pack. However, bulk packages, commonly found at Costco or Sam’s Club, can cost anywhere from $7 to as much as $15 per 14-count pack. Walmart, for example, sells popular brands such as Trident, Extra, Orbit, Eclipse, Wrigley, ICE BREAKERS, Stride and Dentyne. From the looks of it, the average three pack, regardless of the brand, was $2 to $3. The best sellers on Amazon.com, Trident and 5 Gum, sell for about $7 to $10 per 10-pack. The average packs, such as the packs near the checkout at the store, will contain 12 to 60 pieces, depending on the brand. They will either be in the shape of a rectangular stick or a small square that resembles a pill, either with a soft and chewy texture the minute you begin to chew or a hard shell on the outside that is then absorbed into the gum. Popular flavors include peppermint, spearmint, watermelon, cinnamon, original bubble gum flavor and tropical. Chewing gum while peeling onions will prevent watering your eyes. Although chewing gum cannot cause any serious health issues, you should not chew gum for more than three to four times a day as it can cause gastritis or even tooth decay. It also puts a lot of tension in the jaw which could cause stress or damage. Gum is not recommended for people with dental fillings as it can damage the tooth filling materials. People with braces are also advised against chewing gum since it can get caught in the braces. Sugar-free gum and gum with Xylitol and Fluorides are said to be a better alternative. Sugar-free gum, sweetened with xylitol, for example, can help reduce plaque and the risk of cavities by cleaning out your teeth after a meal. It can also help by neutralizing the bad odors and can even whiten the teeth. According to the American Dental Association, chewing sugar-free gum will wash away any bacteria, which can help protect the teeth. If you are trying to lose weight, chewing gum can help. The next time you crave a snack or a second helping of dessert, pop a stick of gum into your mouth instead. Since gum contains very few calories per serving, it makes an ideal snack that will not ruin your diet. The act of chewing and the flavor of the gum will help you fight your cravings for other snacks that are high in calories and fats. In addition to gum being good for oral health, it also aids in digestion since chewing gum results in extra saliva that is swallowed constantly. When chewed after eating a meal, this saliva helps aid in keeping digestive acids in the stomach. Many name brands offer coupons and discounts through their website when you sign up for their email newsletter and/or via their social media outlets. Consider purchasing in bulk from local warehouse clubs such as Costco and Sam’s Club.